Real-time lighting effects are a highlight of high-fidelity games like Battlefield V and Metro Exodus, but now they’re also available in the chunky world of Minecraft. A modder has created a ray tracing shader for use in the classic building game. Okay, so it’s not ray tracing, exactly – technically, the rendering method modder Sonic Ether uses to create real-time global illumination in Minecraft is called path tracing. 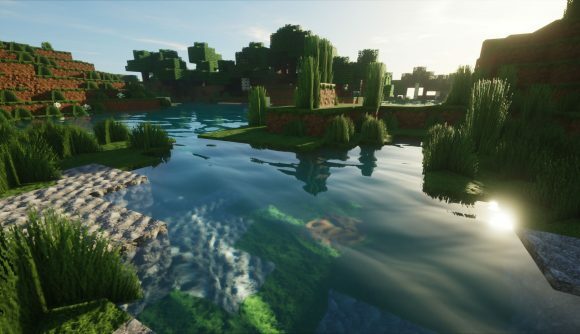 The difference is that path tracing uses rays that bounce many times throughout a scene, but the effect is similar to that of ray tracing: gorgeously-lit and shadowed scenes, even in something as simple-looking as Minecraft. An artist who goes by @notglacier spotted the shader and posted a couple short videos of how it looks in game. The results are pretty astonishing: beautiful beams of sunlight angle through a glass ceiling onto a shiny reflective floor, and a torch gives off a realistic warm glow in the second. You almost forget that you’re looking at Minecraft – until he plunks down a switch on the wall, and you remember the original, pixel-texture graphics. In any case, it’s impressive work. If you’d like to try it out yourself, you can download Sonic Ether’s Unbelievable Shaders (SEUS) Renewed from his website, which is here. It’s currently in version 1.0.0, and it’s a small download of just 6.74 MB. You can also support Sonic Ether on Patreon, and a monthly pledge will grant access to his Discord server, with higher tiers available if you’d like to try out experimental development builds. He says his goal is to push Minecraft’s visuals “to the limit,” and it seems he’s done just that.